Are you exhausted trying to create the perfect home for your family? You can take the pressure off, mama! Read on to find out why. There is nothing scarier than waking up to strange fumes in your house in the middle of the night. OK, maybe it wasn’t as scary as the “This is Us” post-Super-Bowl episode, but it was still scary. That’s what happened on the night of our twin sons’ 2nd birthday last year. We had just celebrated our boys’ day with cake and balloons and then wrangled the sugared-up boys to bed. As expected, after all that toddler goodness, I collapsed into bed somewhere around 8:30pm. Sometime in the middle of the night, I woke up gagging from toxic fumes. I shoved my husband in a panic, fumbling for my glasses and car keys to get the boys the heck out of the house. My husband jumped out of bed to check it out, and no, it wasn’t the Crockpot on fire. It was the oil burner in the basement. No fire, but he shut it down, put blankets by the door to block any fumes, and we camped out in the living room for the rest of the night. The next day, the technician told us we had a crack in the chamber of our oil burner. As a result, soot had been blowing through the entire house. There were traces of it in every room. Thankfully, our insurance company was going to pay for our house to be cleaned, repainted, carpets ripped up and floors replaced – and a new oil burner, which was a huge silver lining. But that was the beginning of the taking apart our home piece by piece. And almost 11 months later, it still hasn’t been put back together yet. First, we had to leave so the house could be cleaned. Then, the dry cleaners came and took all of our clothes, linens, sheets, towels, curtains – all the fabrics – to be cleaned (no complaints from me!). Then, they ripped up our carpets (which revealed a darling 1950’s pseudo-tile floor), and in a futile attempt to keep my twin 2 year-old boys off those disgusting floors, we covered our entire living room with blankets. We lived like that for 3 weeks. During that time, we packed up everything. EVERYTHING. The whole house had to be EMPTY for the work to be done. Everything off the walls, all the furniture out, all our belongings in boxes. – like we were moving (which, by the way, was in our future plans, so it was actually good that we had to purge and pack up). The insurance company sent over a POD for our stuff, and we were sent to a hotel for the duration (not as glamorous as it sounds, with 2 toddlers). The end result? Our house, which had been a bit ‘worn,’ now was beautiful. We were planning to put it up for sale once we fixed it up (which was now done, thank you, insurance company), and our logic was, if we were planning to sell, why unpack our stuff, just to pack it up again? So, we unpacked the essentials, purged what we weren’t taking, and the rest went in the basement crawl space. That was last May. And we are still living like that. For almost a year, my house has not been home. No pictures of my boys on the wall. No wedding photos. No decor. Just the basics: a couch, a TV (of course a TV), a chair, a kitchen table, beds, and a plethora of toys. It’s where we live, but it’s not home. As moms, all we want is to create this space for our families. A haven for relationships, discipling, laughter, and memories. We want the picture-perfect home and the picture perfect family to put in it. Call it nesting, call it maternal instinct, but making a home is mom territory – trespassers beware. For a million reasons -and most of them noble – we invest our hearts and souls in building this little kingdom. All our energy and efforts sown here, and if it falls short, we feel like failures. Now, I know when we move to Tennessee, it won’t be the Promised Land and it won’t be solve every problem we have and the sky won’t open up over our new house with perpetual sunlight from heaven. But I’m aching for home. A desire for home, the need to have a place to feel settled and anchored is God-given. But the irony is that while we spend so much energy trying to create this, we will never find it here. 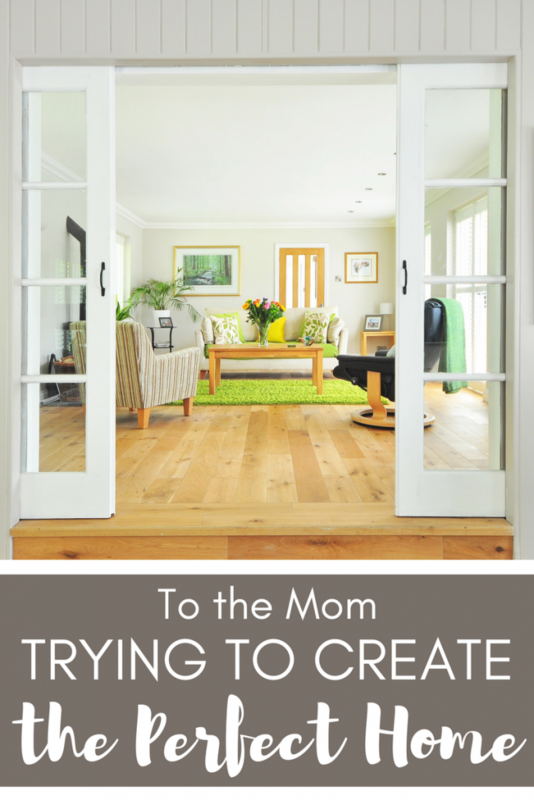 As moms, we spend SO much of our energy trying to create these perfect homes – meticulously clean (I’m failing for sure in that area), Instagram-worthy decor, Pinterest-approved meals. We try so hard. I’m not saying that we shouldn’t to do these things (ummmm, take a look at my blog, lol). What I am saying is that it won’t provide the complete comfort and anchoring that our souls are really longing for. Because this isn’t our home. Our God is so loving that He generously provides beautiful gifts like a place to call home for our temporary existence here. He’s not against that. In fact, He himself clothes the fields with lilies that are here today and gone tomorrow. He’s OK with making a temporary space beautiful. And the temporary homes He provides bring us joy, peace, and comfort. But not completely. Never completely. While we are so busy trying to perfect these temporary home here, our Father is preparing a perfect place for us in His house. Our permanent address is not to be found anywhere on this planet. Crazy, right? It’s hard to wrap our minds around the fact that our real home, the one where we will feel safest and most welcomed and most at peace is one we have never seen or been to. So, am I still off-put by my living situation? Am I still aching for a space to put my personal stamp on and make my own? Do I still want a cozy, safe space to raise my boys in and give them the childhood and upbringing I’ve always dreamed of giving them? Yes, yes, and yes. But there’s a difference in our efforts when the underlying foundation that we are building our homes on is the reality that these homes don’t have to be perfect. They aren’t permanent. They will only be fulfilling and satisfying to the extent that they point our families (and us) to our real home. 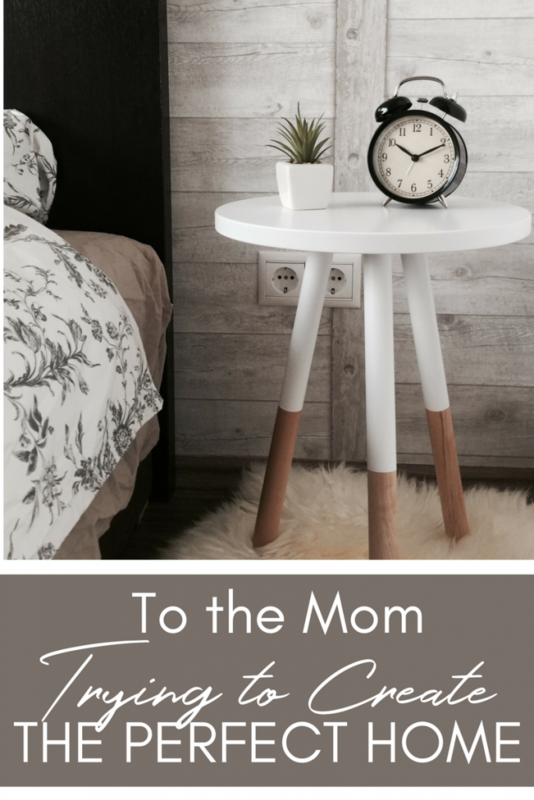 So moms, you are fine to continue with Insta-decorating and Pinterest-cooking and all the other things that make your house a home. It’s all good. But we don’t have to live up to the world’s standards of home. The pressure is off, and that’s really good news. As hard as we try, it will fall short in some measure – never clean enough, never pretty enough, never stylish enough. Never enough. The sooner we come to peace with that reality, the sooner we will feel at peace in our homes. And really, what is it about home that means so much to us? It’s family. And once we are really home, we will be with our true family forever – with God, with our brothers, our sisters, our kids, everyone in the Lord who has ever meant anything to us. All under one roof. Sounds like the perfect home to me. One of the most important jobs we have as moms is making sure that the homes we create here do their jobs in pointing our families to home they’ll have eternally. If we make sure our kiddos know the address and have the directions to THAT home, we’re all good, mama. Our wanna-be perfect homes will have served their purpose. What are your thoughts about home? Do you feel the pressure to make it perfect? What does home mean for you? So beautifully said! Good reminders. Thank you for sharing. This is such a good reminder, this is something I struggle with too! I love this so much! I can totally relate as a home decor enthusiast coming to terms that my house can never be clean with my three little monsters running around. Home is family, home is memories, and this home is temporary. Beautiful! Attempting to create beautiful things here on earth should remind us of the true and perfect Creator who gave us the gift of beauty. If we only see reflections of His beauty here, I can't imagine the joy of experiencing the presence of His glory in Heaven. As an Army family, we move quite often, so our idea of home is a little different! Every couple of years, we're reminded this world is not our final home! Beautifully encouraging words! Blessings! Thank you so much for sharing this! It’s so easy to lose perspective that this home is only temporary. The more kids we have, the harder it is to even TRY to have a perfect home. I think it has helped to work some of the desire for ‘perfect’ out of me. When it starts looking great, I get upset at messes and accidents. But when I accept that we LIVE here and I love these mess makers, perfect doesn’t seem so great anymore! Great thoughts, thank you! Oh yes, photos of everyone’s perfectly styled homes can make me feel that way too! A reminder to post real-life pictures, not just the pretty stuff! Absolutely! If you see my IG, the imperfections abound!